On September 11th, 2005, Sam Roberts of The New York Times found himself wondering aloud how mighty island Manhattan could be evacuated in case of emergency. Could this be it, then? 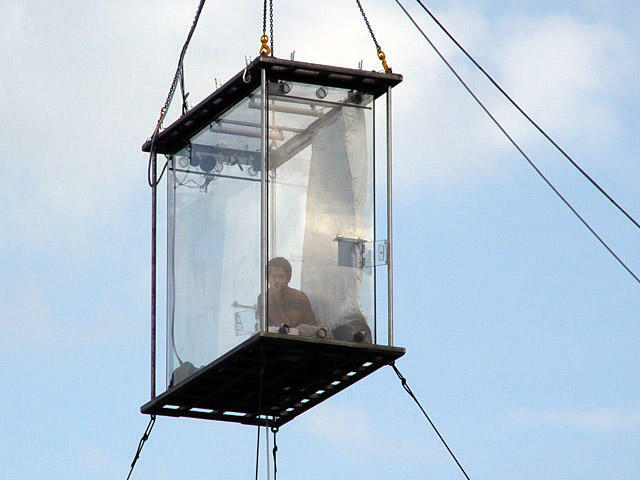 The greatest opportunity of all time for an ambitious urban performance artist? To evacuate Manhattan? Leaving behind an unpopulated void of steaming sewer lines, windswept avenues? The entire archipelago reduced to silence, almost instantly prehistoric; birds soar in the self-reflecting absence between bank towers. – you’ve just made 8 million people go to Weehawken. OK – but as Houston just proved, private car owners do not make large-scale evacuations any easier. In fact, leaving such evacuations to the private sphere – that is, to people who own and maintain private automobiles – is illogical from the very beginning. 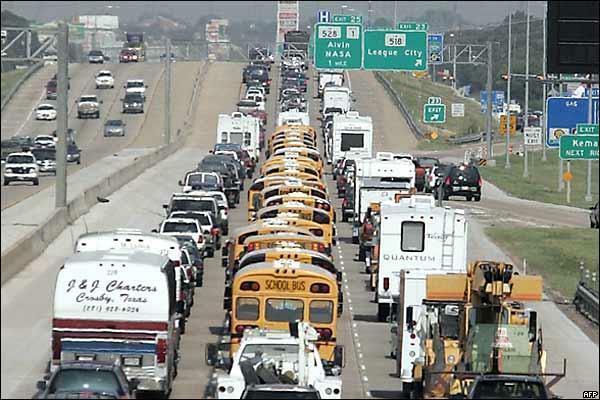 [Image: Private automobile owners fleeing Hurricane Rita – now imagine them all trying to merge into Lincoln Tunnel]. 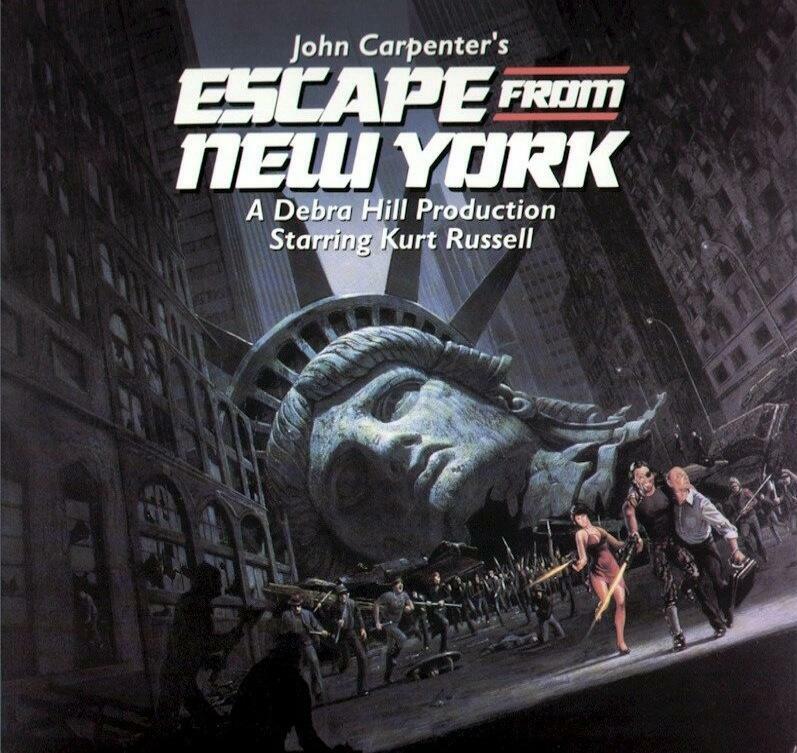 Even so, the evacuation of Manhattan has been simulated for decades. “[A]fter a test-run,” for instance, using “a flotilla of 20 ferries, barges and tugboats up the East River in 1951, officials figured [that] 100,000 [people] an hour could be spirited away for six hours; [but] then the flow ‘would taper off for lack of equipment'” – leaving everyone else to fend for themselves. (It is worth adding the obvious here: the population of Manhattan has grown substantially since 1951 – 600,000 people would hardly even be noticed). Sensing disaster, someone soon proposed that the city could build “two cross-town expressways to speed the escape from Manhattan” – or, urban space as advance imprint of impending catastrophe. It is interesting, sarcasm aside, to consider what new feats of urban design could preemptively account for this future, inevitable evacuation of the iron island. A series of pedestrian bridges to New Jersey, perhaps? Or some helipads? Tax breaks for evacuation taxi drivers? Pedestrian tunnels, leading to Queens, Brooklyn, New Jersey, and even Staten Island? A light rail? More boats? Perhaps the entirety of the Lower East Side could literally stand up – buildings and all – and just walk away? [Image: Ron Herron/Archigram, “A Walking City”]. by foot is only a major problem if this northern route is somehow blocked off. The real issue is not evacuating Manhattan, but evacuating Long Island. LI is over 100 miles long, the western end of it is Brooklyn and Queens, NYC’s two most populous boroughs with nearly 5 million people between them. Another 3 million live on the rest of the island. Off the eastern tip of the North Fork is Plum Island, a top secret government biological research lab. There are 8 bridges and at least that many tunnels leading off the island, but all the tunnels and 4 of the bridges lead straight to Manhattan (and one more forks with routes into both Manhattan and the Bronx). Essentially evacuating the island means either filtering most of the people through Manhattan or a massive water based effort. Perhaps that flotilla in the East River was meant more to get people out of Brooklyn and Queens than out of Manhattan? Nice – more interesting than my own take. You picked up on one or two things I consciously sort of glossed over – if evacuating Manhattan, then whither Long Island? and Staten Island? how get them out of the archipelago? ; as well as the issue of the ‘rising’ population of Manhattan (more on that in a minute) – but also some great stuff I just didn’t pursue, to my open discredit. The original idea for the post was to write a sort of fast and quick piss-take about a performance art piece that would get everyone off of Manhattan, evacuating Manhattan, as if to prove how bad FEMA really was (‘if a dude with an MFA can do it… why not Bush’s FEMA?’ – that sort of thing), and that was supposed to be it, really; but I just kept going, and didn’t delve far enough into the material, using the NYTimes article as only source. I believe, given about a week, New York City (all 5 boroughs) could be evacuated. The problem, of course, is where do you put all the people. 6 million or so people cannot all be parked in New Jersey, CT and upstate NY. Those areas would implode due to lack of infrastructure. First, a neighborhood based group would need to go door to door and find out who has relatives or friends where in the country. Then people will board trains, buses or boats which are direct expresses to outlying destinations as far as they must go (airport, transfer station or destination). A good model is FedEx or UPS – they take packages to regional sorting facilities then to local depots and finally to the destination for delivery. Not to say people are packages, but the model could work. I believe such as scenario should be simulated in a supercomputer and see what happens. Perhaps a web-based model along the lines of the SETI project can be created by some enterprising geek! First, people would not be allowed to use their own vehicles. Buses, Trains, Boats and Feet would be the only way. It would need to be done by street, beginning at the points farthest from rail lines, rivers, tunnels and bridges. Interior streets should be closed completely, and vehicles should only be permitted around the perimeter. The same process could be used for any city or county or even state. But a unified approach needs to be created by simulation and consensus, then a software, infrastructure and transportation system needs to be distributed to all municipalities, counties and states.And the public needs to know about this through public information handouts. Interesting. The problem of evacuating cities, especially Manhattan was studied extensively. Associated Universities’ Project East River was all about this. 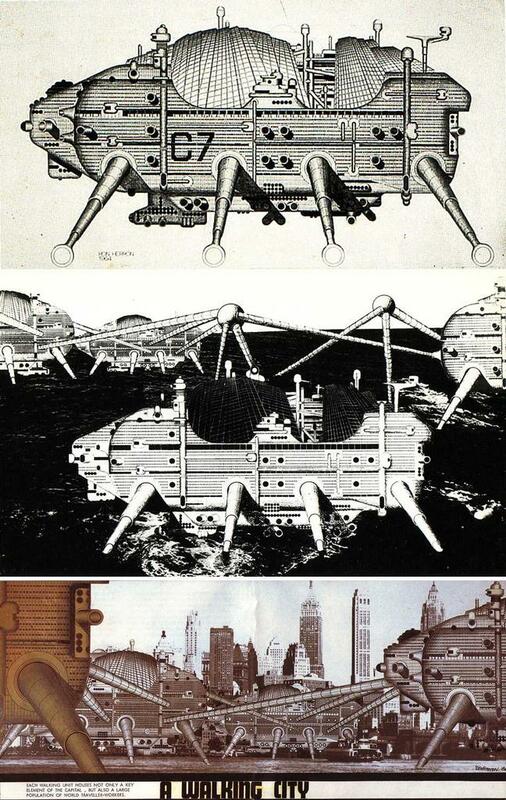 Hugh Ferriss rendered evacuation as well as a bombproof shelter, possibly located around NYC. These drawings are in the archives of Columbia’s Avery Library. Herman Kahn’s Hudson Institute scenerio for evacuation used Candor NY as its typical upstate point of arrival. Another Long Island military landmark of note, at this time, was Associated Unitersities’ Brookhaven Laboratory. Perhaps evacuation of Long Island wasn’t so much of an issue if key personnel at these these military landmarks could be evacuated to an underground blast shelter. In my research I haven’t found definitive proof that a blast shelter below Manhattan was ever constructed. I believe it was extensively studied, and I believe Welfare Island may have been studied as a possible point of access to it if it existed/exists. In this context, it’s interesting to reread Koolhaas’ Delerious New York , especially his references to evacuation, devastation, and Welfare Island. It’s very curious to me that Koolhaas is facinated with Ferriss’ renderings but fails to note Ferriss’ bombshelter renderings as he suggests and illustrates exodus. Also, these studies for evacuation were about population dispersal, and those who participated in the drafting of the reports were in positions to implement and train for the future. These eyeopening statistics related to population trends in Manhattan suggest that perhaps these planners not only studied, but successfully implemented.